One element of the elaborate sculpture ‘The Snail Under a Mushroom’ was this easy-to-make, utterly delicious rye loaf. It is richly flavoured with malt extract and treacle, and studded with sunflower seeds and shaped into an oval. Step 1 – Put the boiling water into a heatproof measuring jug. Add the black treacle and malt extract and stir well until dissolved. Leave to cool until tepid. Step 2 – Put both flours into the bowl of a stand mixer, add the yeast and mix with your hand until thoroughly combined. Mix in the salt and sunflower seeds. Step 3 – Make a well in the centre of the mixture and pour in the tepid treacle liquid, the oil and three quarters of the tepid water. Fit the dough hook to your stand mixer and, on the slowest speed, gradually work the flours into the liquids, adding more of the tepid water as needed to make a shaggy-looking, very soft and slightly sticky dough. Step 4 – Leave to stand for about 5 minutes, then work the dough again for 1 minute. If it feels firm, or stiff and dry, work in a little more tepid water to make a soft dough that leaves the sides of the bowl clean. Step 5 – Turn out the dough onto a lightly floured worktop and knead thoroughly for 12 minutes, until it feels slightly firmer, stretchy and pliable (it will feel stickier than a white-flour dough). Step 6 – Put the dough in a clean, lightly oiled bowl, cover tightly with cling film, and leave to rise somewhere warm for about 1–1½ hours, until doubled in size. Step 7 – Punch down the risen dough, then turn it out onto a lightly floured worktop. Knead it very lightly for 1 minute to break up any large air bubbles. Then, knead it into a neat ball and gently shape into an oval of about 22 x 15cm. Using the side of your hand, make a deep crease lengthways along the centre of the dough. Step 8 – Roll the dough onto its side to make a 2-layer sausage shape. Pinch the seam (where the 2 pieces of dough meet) to seal neatly, then roll over again so the seam is underneath and the top looks smooth. Place the dough onto the lined baking sheet and, if necessary, gently shape it back into a neat oval. Step 9 – Slash the top of the loaf a few times diagonally with a sharp knife, then cover loosely with cling film. Leave to prove for about 50–60 minutes, until doubled in size. Towards the end of this proving time, heat the oven to 220°C/200°C fan/425°F/Gas 7 and place an empty roasting tin in the bottom of the oven. Step 10 – Lightly brush the top of the risen loaf with water. 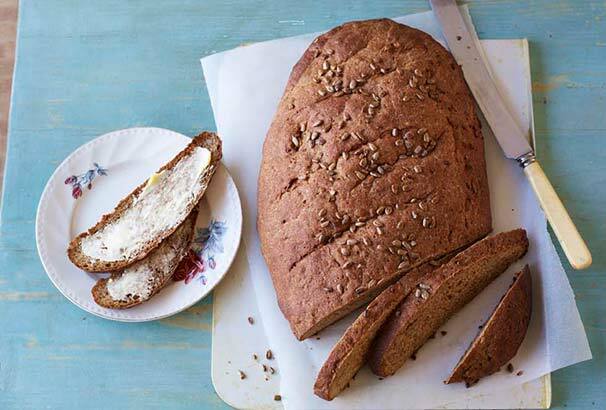 Scatter over a few sunflower seeds and put the loaf into the oven. Pour a jug of cold water into the hot roasting tin (to create a burst of steam), then close the oven. Step 11 – Bake the loaf for 15 minutes, then rotate the baking sheet and reduce the oven temperature to 190°C/170°C fan/375°F/Gas 5. Bake for a further 20–25 minutes, until the loaf is a rich chestnut brown and sounds hollow when you tap the base. Transfer to a wire rack and leave to cool completely.